When Do Kittens Lose Their Baby Teeth? Just like human children, puppies and kittens lose their baby teeth. These teeth are also called "milk teeth" or in medical terms, deciduous teeth. They are then replaced by permanent adult teeth. The process can be a bit disconcerting, but it's perfectly normal and you only need to regularly examine your cat's mouth. In rare cases, your kitten may need dental care to be sure her new teeth fit properly in her mouth. Kittens are born without any teeth at all. Their first teeth (usually the incisors at the front of the mouth) begin to appear at about two weeks of age. The baby teeth are a bit translucent, and not very big. These teeth are sometimes called "milk teeth." Two weeks later, you should notice their fangs growing in. By the time they are six weeks old, their "premolars" will have appeared. All of these 26 teeth are deciduous, meaning that they will drop out and be replaced by adult teeth. Puppies and kittens have sharp, needle-like teeth. A full set of emerging teeth irritate the nursing mother, and the weaning process begins. This is the point at which kittens stop nursing and begin eating solid food on their own. If you have a foster kitten or a kitten who was separated from its mother, you may have been providing supplementary nutrition through a bottle. If that's the case, now is a good time to stop bottle feeding and allow your kitten to start eating entirely on her own. The start time and duration of the transition from baby teeth to adult teeth vary with each individual animal, but in general, the loss of baby teeth usually starts at about three months of age and ends by six to nine months of age. avoid brushing her teeth or gums, as this could be painful for her. Baby teeth may come out at any time and in any place. You may find the baby teeth on the carpet, stuck in a play toy, or in your pet's fur. Most often, the lost teeth are hard to find. Many animals swallow them, which is normal and not harmful to your pet. The gums should heal quickly after the loss of a baby tooth. The adult teeth are more dense, bright white, and much larger than the outgoing baby teeth. Animals that do not lose their baby teeth have a condition called retained deciduous teeth. 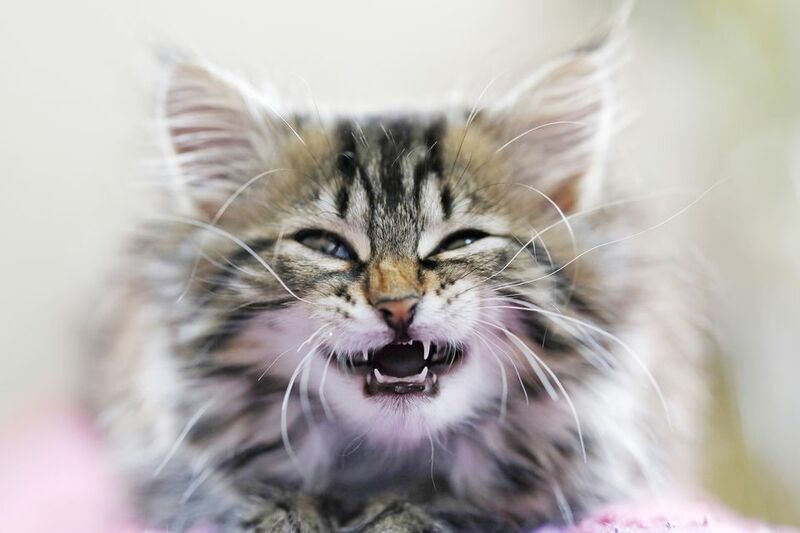 It is often the canine teeth (the "fangs" in both dogs and cats) that are retained. Retained teeth should be removed, usually at the time of spay or neuter, to prevent other problems from developing. Removal of these retained teeth allows the adult teeth to grow in properly and prevents breakage or infection of the more fragile baby teeth. Now is the time to take care of those teeth! Getting your pet used to a dental care routine while young is the best way to ensure dental health later on. It is also much easier to start with a "clean slate" of nice white teeth and healthy gums. How Old Should a Kitten Be Before You Take It Home?